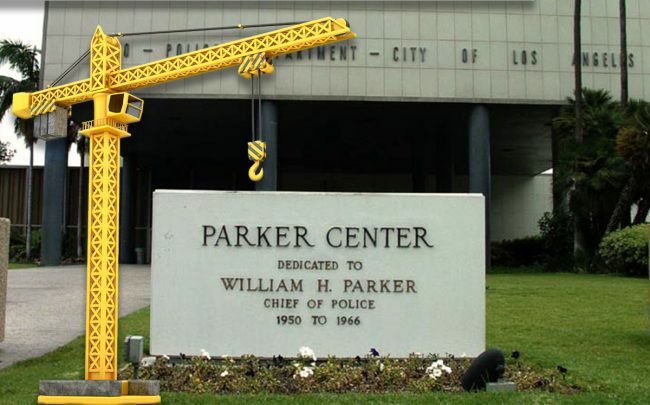 The city is beginning its search for a development team to build a new office tower at the site of the Parker Center, the former police headquarters that is part of the Civic Center. At least three are expected to submit plans. Los Angeles officials have outlined a plan for a building of about 27 floors with 750,000 square feet of office space, 65,000 square feet of ground floor retail, and parking for 1,200 vehicles, according to Urbanize. The city owns the property. The city is scheduled to issue its request for qualifications on Monday, the first step toward selecting a developer to work on the project. Responses are due at the end of May. Three development teams are reportedly planning to submit a plan for the project, according to the report. They are: Fengate, Tutor Perini, and BIG Architecture; Meridiam, Clark Construction, Edgemoor Infrastructure and Real Estate, Skidmore, Owings & Merrill, and ENGIE; and Plenary, Johnson Controls, and Webcor. The campaign to replace the aging former police headquarters has been a point of controversy since the city proposed replacing it in 2014. Conservationists immediately moved to landmark the 1955-built building and waged a long though ultimately unsuccessful bid. The AIDS Healthcare Foundation tried to halt demolition with a lawsuit in August, calling the project a “flagrant waste of money” after the release of a city report that found the cost for the replacement project had increased from below $500 million to more than $700 million.